The Wooden Tserkvas of the Carpathian Region in Poland and Ukraine comprises 16 wooden churches built by horizontal log construction. They are located in isolated parts of the Carpathian Mountains. They were built by communities of the Eastern Orthodox and Greek Catholic faiths in the 16th-19th centuries. The 16 churches can be divided into four groups of different ethnographic architectural traditions. 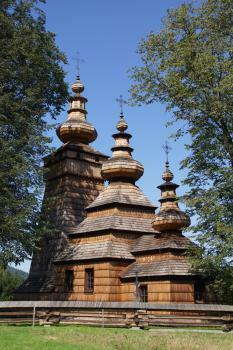 The Wooden Tserkvas of the Carpathian Region are 16 wooden churches in the border region of Poland and Ukraine. There are 8 inscribed churches in each country. During my long weekend in southeastern Poland I focused on the Polish ones. Beforehand I plotted them all on a map, and as you can see in the figure below it will take a long drive to cover them all. Two tserkvas straddle the Ukranian border below Zamosc, and I was tempted to drive even further north to include that WHS also. But it still is a 1.5 hour drive from Radruz. Daytrips to L’viv in Ukraine are also advertised from the larger cities in this region, so this is a true hotspot. In the end I only had time for the 6 in southern Poland, those that lie near the border with Slovakia. Most of the previous reviewers seem to have visited the cluster of 4 below Gorlice, although John Booth of course made it even to the most remote ones by public transport! ‘Tserkva’ means ‘church’ in the Ukrainian language. Most of these churches were built for the Ukrainian Greek Catholic Church, an Eastern Rite Catholic church (sharing traditions with the orthodox churches but acting in full communion with the Holy See). Since the Ukrainian population left the area after WWII almost all tserkvas in Poland have come into use as Roman Catholic churches. They have retained their traditionial (orthodox) iconostases, and the catholic service is performed in front of those. This mix of the Orthodox and Catholic branches of Christianity is one of the more interesting features of this set of wooden churches. I drove around in this region on a Sunday, and met many churchgoers on foot. The designated churches certainly aren’t the only interesting wooden churches in this area: some more recent ones are still heavily used, with people even standing outside to attend the service. Only one of the 6 tserkvas on my list was in use for a service, but I encountered visitors at all of them – mostly Polish tourists. The region felt less remote and ‘backward’ than I had imagined . There are villages everywhere, and supermarkets and gas stations were open on Sundays. My favourites among the 6 churches were the ones in Kwiation and Turzansk. The last one is special because it nowadays is in use as an Orthodox church, not a Roman Catholic one. Unfortunately I couldn’t get in, but with its 5 metallic domes plus a separate bell tower it is picture perfect. It also looks much bigger than the other ones, maybe because it lies in an open field. The sixth and final church of my tour lies in the extreme southeastern tip of Poland, a few kilometers from the Ukrainian border. I added it to my route because it seemed so remote: the village of Smolnik to which it belongs has only 182 inhabitants. But on arrival it turned out to be the busiest of them all! There were already a few cars in the parking lot, and a couple arrived by bike. The church was open. Here no special murals or glossy iconostasis: the decor consists of deer antlers! They cover the walls and even the chandeliers are made out of them. A quick negotiation with a taxi driver, in some combination of English, Ukrainian, Russian and me taking wild stabs at the few words of Czech I know and hoping they would make sense meant I was soon in the back of a Skoda heading over the potholes and cobbles of the Lviv ring road. About 35 minutes later I was deposited at a this tiny church with reassurances that the driver would be back in 15 minutes. This 15 minutes was actually probably three times the amount of time I needed. As it was a beautiful Sunday morning there was a service happening inside. Even if I was of a mind to visit during the sermons, the church is so small there wasn’t even a chance to sneak into a corner without disturbing everyone inside. So that just left me able to walk several laps, focusing on the intricate details of the wooden construction that apparently help differentiate them from other inscribed Wooden churches; the flat plank corner construction, the three doomed cupolas (of which this is apparently the finest example) and the stone belfry. It also allowed me to find the notice board engraved with the term “World Heritage Object” confirming my trip hadn’t been wasted. It was enjoyable and I was able to catch a glimpse of the interior as one of the congregation caught my eye and beckoned me to the door to have a closer look. It certainly was an impressive array of gold frames around the painted robes of various saints, but I didn’t want to intrude so wandered back to meet my taxi driver who quickly took me back to my hotel in central Lviv. All in all it was about an hour and a half from Lviv airport to Zhovkva, to visit and then being dropped at my hotel in central Lviv. I can’t seem to find details on the train service even though Zhovkva does have a station, I couldn’t find anything online that suggests trains actually service this route, but there seem to be very regular buses that depart from Lviv 2 (Northern) bus station. But with no planning and limited time I had to go for the slightly less rewarding option of a a taxi and it was a pretty straightforward journey to organise, the whole trip cost me in the region of 500UAH/ €15 (2019). The bus seems to be about a tenth of that cost and takes between 20 and 40 minutes each way. Though you will have to factor in getting out to the Northern bus station if you are coming from the city centre. It certainly felt like a wonderful little side trip and easy to achieve from Lviv. The site itself was rather lovely, though even if you could visit the interior it would still take a very forensic investigation to make a visit last more than 25 minutes. 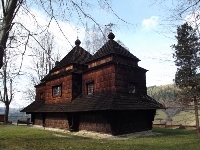 The Wooden Tserkvas in the Polish part of the Carpathians have already been well-covered by the reviewers active on this website. I visited 6 of them myself in 2015. However, 8 of the inscribed tserkvas (churches) lie just across the border in Ukraine. Noone wrote a report on one of those yet. As I had half a day to spare after visiting L’viv, I hired a taxi to take me to the wooden Holy Trinity Church in Zhovkva – part of the Later Halych Group of the inscribed Ukrainian tserkvas. Zhovkva is a town of 13,000 inhabitants, about 30km northwest of L’viv. The drive takes just half an hour and doesn’t bring very remarkable scenery. The roads out of L’viv are potholed, many of the streets leading from the main streets into villages are still unpaved. 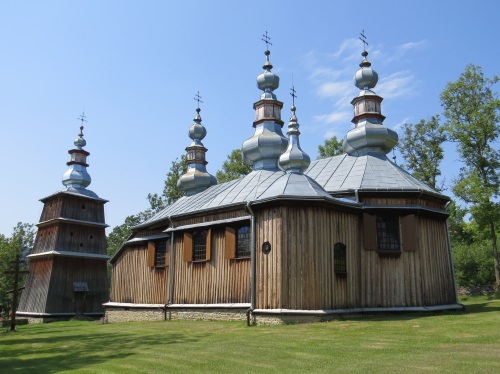 Inspired by the Polish churches which lie in sometimes idyllic rural settings, I hoped to get a glimpse of the Ukrainian countryside by going to Zhovkva. It didn’t turn out to be that way however. The Holy Trinity Church lies beside the main road that leads from L’viv to Zhovkva city center. I had brought a print with me including the name of the church in Ukrainian and a picture of it, just to be sure. But it cannot be overlooked, and is even signposted in English with the same type of bilingual signs that point to the various sights in L’viv. It looks a bit out of place in its suburban setting, but the specific type of wooden construction and good state of conservation made me glad that I had taken this sidetrip. The church dates from 1720. I would have been reasonably content admiring the tripartite church from the outside, but the icing on the cake of course would be to get in. Just as with the Polish churches, I found a phone number attached to the front door to call for someone with the key. Fortunately I did not have to ask my hesitantly German-speaking driver to make the phone call for me in Ukrainian: the door was open and two men were already inside – probably cleaning away after Sunday’s service. The building is nowadays used by the Ukrainian Greek Catholic church. 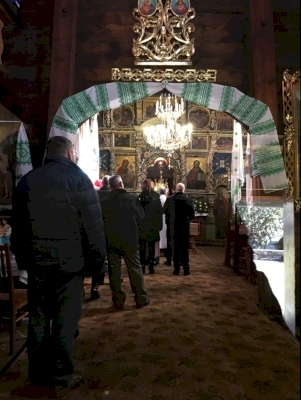 The lay-out of the church is quite similar to that of the other tserkvas: one enters via the narthex (featuring a bunch of brochures and what may be a baptismal font), reaches the nave annex choir and it all ends at the iconostasis. There isn’t space for many churchgoers: five rows of benches are placed on each side. However, this tserkva has a choir loft worthy of a much larger church. This is all decorated with many icons, paintings and the lovely iconostasis - “The interior furnishings survive intact, offering the best example of the integral interior design of an 18th-century tserkva”, according to the nomination file. Odd addition to this wooden structure is the white brick sacristy, which also dates from the 18th century. After a while the priest, who had been working in the sacristy behind the iconostasis, came to greet me. He asked whether I was Polish – most tourists that come here are. Unfortunately he didn’t speak more than a word or two in English and German, but he was obviously proud of his little church. The written Unesco inscription certificate has been prominently nailed to one of the walls, amidst the paintings of saints. 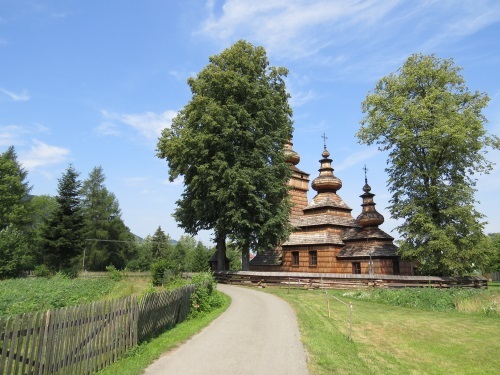 The tserkvas in the Polish Carpathians were definitely our favourites among the three wooden church WHS and one of the highlights of our trip through Lesser Poland and Slovakia in August 2014. The sites are an amazing mixture of outstanding architecture, beautiful wall paintings and interior decorations, and a picturesque landscape. The WHS consists of sixteen wooden churches, examples of four different architectural styles each representing a specific ethnographic tradition. We visited the five westernmost churches, all of the so-called Lemko type. The distinctive feature (compared to the other two inscriptions) is the tripartite ground plan - porch, nave and chancel - surmounted by octagonal cupolas, the highest cupola is above the porch, with the roof sloping downward towards the chancel. Inside, I was particularly impressed by the magnificent and colourful Iconostases. Four of the churches are close together, within a driving distance of about 75 km, near the Slovakian border and not far from the WHS Bardejov in Slovakia. We enjoyed our ride in the hilly countryside, our tom-tom did a good job, only once it suggested an impassable dirt road. All churches were open to visitors and the entrance was free. The people in this region seemed to be very proud of their churches, they willingly showed us everything and were very happy when we appreciated the quality of the art works and the architecture and the good state of preservation. Owczary: a very nice and typical example of the tripartite architecture; the churchyard is surrounded by a stone wall with a massive brick-built gate; inside a beautiful iconostasis in red and blue with decorated pillars and doors in golden colour. Kwiatori (photo): another fine example with very harmonious proportions; an elaborate roof construction of multiple planes due to the different heights of the domes and their multi-level design. Although I learned a lot about the architecture and the characteristics of different wooden churches, I'm still unsure whether three serial WHS are the best option for their classification. However, the number of WHS is not a major issue for me. But it may be controversial how many individual sites are required to represent the category of wooden churches. But I am glad that we have visited eighteen of them. I visited this WHS in September 2014. I only visited the 4 out of the 8 tserkvas of Poland but I think I got the gist of the OUV of this transnational WHS. That said, I'd really love to visit the tserkvas of Ukraine as well as the remaining tserkvas of Poland as their architecture and location make them truly hidden gems. I had put a lot of preparation work prior to visiting this WHS. From the UNESCO website I got the coordinates of the 4 tserkvas I wanted to visit and saved them on my navigator. This turned out to be a very wise decision as sign posts are non-existant while most of them are hidden by tall trees and are quite isolated. The tserkva of St. Michael the Archangel in Brunary Wyzne was closed when I visited so I took some quick pictures knowing that it wasn't the most beautiful tserkva. Next I visited the tserkva of St. Jacob the Younger in Powroznik where I was welcomed by a young priest. Entrance was free and shortly after I went inside the church, the priest showed me the way to the small sacristy with incredibly beautiful paintings on the wooden walls. Of all the tserkvas I visited this one had the best interior by far. The exterior was really beautiful too but it was almost impossible to take photos of it as it hidden behind the tall trees that kept it hidden well and always in the shade. Perhaps visiting on a sunny day in Winter or Autumn would be the best bet for photography as the surrounding trees are deciduous, meaning they lose their leaves seasonally, revealing the lovely tserkva behind. Before leaving I went back inside for one last quick peek and luckily I noticed a frame on the dark church wall. Upon closer inspection I realised it was the UNESCO WHS certificate! Next I visited the small tserkva of St. Paraskevi in Kwiaton. Its architecture is harmonious and really photogenic but its best feature is the iconostasis inside. 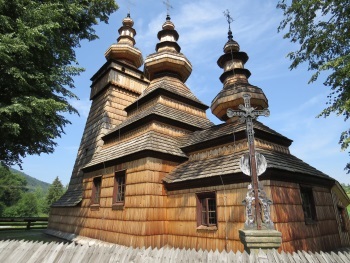 The last tserkva I visited was the Tserkva of Our Lady's Protection in Owczary. It has a smaller iconostasis inside which is still worth visiting. Again entrance is free so I felt compelled to buy a small souvenir. I bought an interesting booklet on The Wooden Architecture Route in the Malapolska Region for only 10 zloty with detailed information and pictures of several wooden churches, most of which are not inscribed on the WH list. My favourite tserkva exterior is the one in Kwiaton although it's quite hard to take good pictures because of the tall trees. The tserkva in Owczary isn't surrounded by trees which makes it the ideal tserkva for photography in summer especially at sunset (picture). Radruz : reached by bus from Jaroslaw and Zamosc changing at Lubaczow. This church was open for visits. The altar screen was elaborately decorated. Chotyniec : reached by bus from Jaroslaw. A very dusty, noisy village with fleets of trucks roaring through. The wooden church was hidden in trees behind a newer one but was closed. It hat an unusual external balcony. Brunary : reached by bus from Krosno, changing at Gorlice. Closed at the time of my visit. Powroznik : reached by bus or train from Krakow, changing at Nowy Sacz. Closed at the time of my visit. Smolnik (pictured) : reached by bus from Krosno, changing at Sanok. Located in the Bieczczady, a scenic part of the Carpathian mountains, with the church sited on a hill overlooking the village. Closed at the time of my visit, but a grille door allowed the interior to be viewed. I think the churches deserve their spot on the list, but I personally did not see the difference between these churches and the churches in the Slovak Carpathians. Further, almost every tiny village in this region has its wooden church. You could spend weeks there, visiting churches. To reach the churches I strongly suggest a car and a navigation system. The churches I tracked down were visible from the street. Each church has its particular shape, so I recommend visiting more than one.